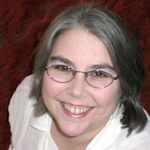 Jo Graham writes historical fantasy. She lives in Maryland. Her influences as a writer are Mary Renault and James Michener, both of whom wrote novels about places and situations unusual for most readers. Graham’s interest in ancient Greece began in high school, when she read The Aeneid in Latin. 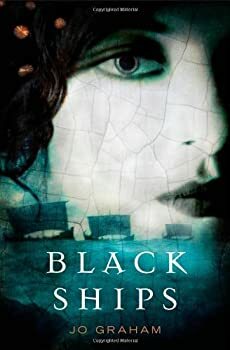 Read an excerpt of Black Ships at Jo Graham’s website. Read Kelly’s interview with Ms Graham. Click here for more stories by Jo Graham. Kelly: One of the ways I can tell I've been truly captivated by a work of historical fiction is that I get the mad urge to go out and learn the real history behind the story! So, of course, I've been looking up Charmian, with extremely limited success. How much is actually known about her? Numinous World — (2008-2013) Publisher: The world is a numinous place for those who have eyes to see it. Welcome to the Numinous World, where gods and angels intervene in the lives of mortals, and a band of eternal companions unite and reunite over the centuries, life after life. Theirs are eternal oaths, to the powers they serve and to one another. Through wars and dark ages, from the ancient Nile valley to the dawn of the twentieth century, they must be true to themselves and to those they serve — no matter what the danger. These are stand-alone historical fantasies set in the same world with overlapping characters who are reincarnated at different points in history. Black Ships (2008) is an adaptation of The Aeneid, Hand of Isis (2009) is the story of Cleopatra, Stealing Fire (2010) occurs after the death of Alexander the Great. The Ravens of Falkenau is a story collection. There's nothing I love so much as sinking into a big fat book that combines the sweep of history with a dash of magic. This book is an adaptation of The Aeneid, from the point of view of the Sybil who, in the poem, guides Aeneas through the underworld. She's a lot more fleshed out here. Her name is Gull, later known as Linnea and as Pythia, and jumps off the page from the very beginning of chapter one with a self-introduction that reminded me a bit of Phèdre's at the beginning of Kushiel's Dart. The wording and the voice are different, but it's the same sort of introduction: This is me. This is who I am. Take me or leave me — and if you take me, I've got a damn good story to tell you. I loved Black Ships, and I didn't know if Jo Graham could top it. The answer, I am happy to report, is a great big YES! 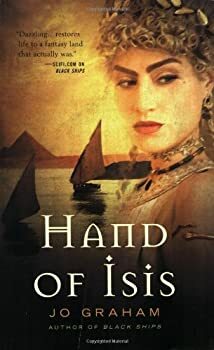 Hand of Isis continues the story of some of the characters from Black Ships who have now been reincarnated as players in the Egyptian-Roman power struggle. You don't need to read Black Ships first, but you'll probably get more out of Hand of Isis if you do. The story is told from the point of view of Cleopatra's "personal assistant," Charmian, who is Gull reincarnated. As the novel opens, she stands before the Egyptian deities in the afterlife and tells her tale. Ever had a meal that was absolutely exquisite, but the portion was so small that your stomach was still rumbling afterward? My experience with Stealing Fire was much like that. Jo Graham’s Numinous World series is best described as “historical fantasy” and revolves around a core group of characters who are reincarnated at various points in history. 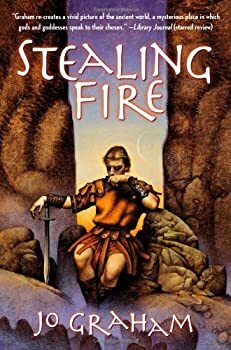 The protagonist of Stealing Fire, Lydias of Miletus, lived previously as Gull in Black Ships, and will later live as Charmian in Hand of Isis. The Emperor’s Agent — (2013) Publisher: Courtesan, actress, medium — spy. 1805: Europe stands poised on the brink of war. Elza is content with her life in the demi-monde, an actress and courtesan in the glittering society of France’s First Empire, but when her former lover is arrested for treason, Elza is blackmailed into informing on her friends and associates. She has one alternative — to become the secret agent of the most feared man in Europe, Napoleon Bonaparte! France’s invasion of England is imminent, but a spy in the camp of the Grand Army threatens the secret plans. Taking the Emperor’s commission to catch the spy means playing the deadly game of spy versus counterspy. However, this is no ordinary espionage, but backed by the power of the witches of England determined to hold England’s sea wards against invasion. Only an agent who is herself a medium can hope to unravel their magic in time — with the life of the man Elza loves hanging in the balance. From the theaters of Paris to the sea cliffs that guard the Channel, from ballrooms and bedrooms to battlefields corporeal and astral, Elza must rely on her wits, her courage, her beauty, and her growing talents as a medium for she must triumph — or die! Cythera — (2013) Publisher: Cythera is a sacred courtesan, one of the fabulous Adepts of Menaechmi, famed through the Nine Worlds for their opulent beauty and decadence. However, when a fragile peace treaty hangs in the balance, the power to stop an interstellar war suddenly rests with her — a mission for which she is unprepared and unqualified. If she is to save thousands of lives, Cythera must not only rely on her wits and sensuality, but on a man she never thought she’d see again who has haunted her dreams for seven years. Athain Kinslayer is a captain in the Calpurnian navy, a star voyager who has given up on personal happiness in pursuit of his duty. His job is to stop a war. The last thing he expects is to have to rely on a sacred courtesan, a woman with whom he spent one unforgettable night seven years ago and has never been able to forget. Together they must undertake a dangerous journey, face unexpected enemies, and delve into the deep and sensual waters of the most hidden rites in order to save their worlds — and find each other. The Order of the Air — (2012-2015) Melissa Scott & Jo Graham. Publisher: In 1929 archeologists began draining Lake Nemi in search of the mysterious ships that have been glimpsed beneath its waters since the reign of Claudius. What they awakened had been drowned for two thousand years. For a very good reason. Veteran aviator Lewis Segura has been drifting since the Great War ended, fetched up at last at the small company run by fellow veterans and pilots Alma Gilchrist and Mitchell Sorley, assisted by their old friend Dr. Jerry Ballard, an archeologist who lost his career when he lost part of his leg. It’s a living, and if it’s not quite what any of them had dreamed of, it’s better than much that they’ve already survived. But Lewis has always dreamed true, and what he sees in his dreams will take them on a dangerous chase from Hollywood to New York to an airship over the Atlantic, and finally to the Groves of Diana Herself….